This article is about the Greek island. For the font family, see Croscore fonts. "Tenos" redirects here. For the town of ancient Thessaly, see Tenos (Thessaly). 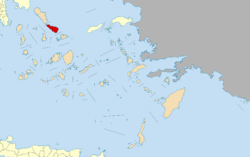 Anciently, the island was called Tenos (Ancient Greek: Τῆνος), and was also called Hydrussa (Ὑδροῦσσα, Ὑδρόεσσα) from the number of its springs, and Ophiussa because it abounded in snakes. The sons of Boreas are said to have been slain in this island by Heracles. In the invasion of Greece by Xerxes I, the Tenians were compelled to serve in the Persian fleet; but a Tenian trireme deserted to the Greeks immediately before the Battle of Salamis (480 BCE), and accordingly the name of the Tenians was inscribed upon the tripod at Delphi in the list of Grecian states which had overthrown the Persians. Pausanias relates that the name of the Tenians was also inscribed on the statue of Zeus at Olympia among the Greeks who had fought at the Battle of Plataea. The Tenians afterwards formed part of the Delian League, and are mentioned among the subject allies of Athens at the time of the Sicilian expedition. They paid a yearly tribute of 3600 drachmae, from which it may be inferred that they enjoyed a considerable share of prosperity. Alexander of Pherae took possession of Tenos for a time; and the island was afterwards granted by Marcus Antonius to the Rhodians. Following the capture of Constantinople by the Fourth Crusade, Tinos was one of several islands ruled by private Venetian citizens and belonged to Andrea Ghisi, whose heirs held it until 1390 when the last member of the family branch bequeathed both Tinos and Mykonos to Venice. It was ruled by Venice until 1715, when Tinos was captured by the Ottoman Empire (see Ottoman–Venetian War), and became known as İstendil. The Ottomans held Tinos until 1821 when the inhabitants joined in the Greek War of Independence. The tumult of the period gave rise to an increase in piracy in the region. In 1825 HMS Cambrian was the lead vessel of a small squadron in anti-piracy operations in the Archipelago, at Alexandria, and around the coasts of Syria. On 27 July 1826, Cambrian's boats captured a pirate bombard and burnt a mistico on Tinos. Five pirates were killed and several wounded. The date of 15 August also commemorates the 1940 sinking in Tinos's harbour of the Greek cruiser Elli, during peacetime, while she rode at anchor, by the Italian submarine Delfino. The Elli was participating in the celebrations of the Feast of the Dormition. One of the three torpedoes fired hit the Elli under the one operating boiler and she caught fire and sank. Nine petty officers and sailors were killed and 24 were wounded. The same submarine attempted to torpedo the passenger ships M/V Elsi and M/V Hesperos anchored in the port. This attempt failed and the torpedoes only damaged a section of the port's wharf. Tinos has a varied landscape. From the shores of Panormos and Kolimbithra on the North Shore to Kionia, Agios Yannis O Portos, and Agios Sostis on the Southern Shore, Tinos has many beaches. Tsiknias is the highest mountain on the island at 750 metres (2,460 feet) and hides the village of Livada. The mountain of Exobourgo is quite distinct, and unlike its more rounded Cycladic neighbors, has a jagged appearance that would be more at home in the Alps. Between Tsiknias and Exobourgo lies the fruitful plain of Falatados. This area is unique on the island as its relatively flat terrain (albeit with an elevation of about 300 metres (980 feet)) is rare on the island. This made it a strong candidate for a proposed airport on the island. The Meltemi winds and concerns of local villagers of the towns of Falatados, and Steni have all but halted the project. The area around Volax is a surreal and very unusual landscape with giant boulders some the size of multi-storey buildings. The village of Volax lies at the center of this landscape. To the west, the mountains surrounding Pyrgos are full of some of the most beautiful green marble in Greece. All around the island of Tinos, the islanders have made the most unusual things out of stone. The hills are all terraced with stone walls and every village is connected to its nearest neighbors by stone walkways set between a parallel set of stone walls. The island's mineral resources include marble, Verde antico, asbestos and a granite mine near Volax (also known as Volakas). The province of Tinos (Greek: Επαρχία Τήνου) was one of the provinces of the Cyclades Prefecture. It had the same territory as the present regional unit. It was abolished in 2006. Tinos experiences a Mediterranean climate and has warm and dry summers and mild and wet winters. In the island you come across the etesians (also known as meltemi winds) the strong, dry north winds of the Aegean Sea, which blow from about mid-May to mid-September. They are at their strongest in the afternoon and often die down at night, but sometimes meltemi winds last for days without a break. Meltemi winds are dangerous to sailors because they come up in clear weather without warning and can blow at 7-8 Beaufort. Tinos has three ports, one for passenger speed boats, and two for ferries and highspeed boats which carry passengers and cars to other ports, including Mykonos (35 min), Piraeus, Rafina, Andros and Syros. There is a heliport close to Aghios Fokas beach, some 2 kilometres (1 mile) from Tinos town. There are regular buses linking Tinos town with other villages on the island. ^ "Art & Tradition:Windmills". 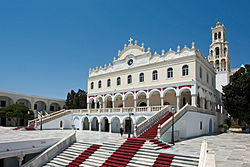 Municipality of Tinos. www.tinos.gr. Archived from the original on 2008-01-05. Retrieved 2007-12-21. ^ Pliny. Naturalis Historia. 4.12.22. ^ Stephanus of Byzantium. Ethnica. s.v. Τῆνος. ^ Apollon. 1.1304, with Schol. ^ Pausanias. Description of Greece. 5.23.2. ^ Franz, Elem. Epigr. Gr. No. 49. This article incorporates text from a publication now in the public domain: Smith, William, ed. (1854–1857). "Tenos". Dictionary of Greek and Roman Geography. London: John Murray. Wikimedia Commons has media related to Tinos.